Because you’re not likely to find food like this outside of Fukui prefecture. Of course, chilled oroshi soba is on the menu at this homely restaurant, but there’s another reason why Hachisuke is worth visiting … Sake! 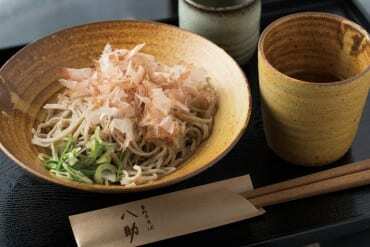 A visit to a soba shop is a great excuse to sample the region’s sakes, because they also serve up small plates, such as tempura or kamaboko (Japanese fish cake), which make great accompaniments to the alcoholic beverage. 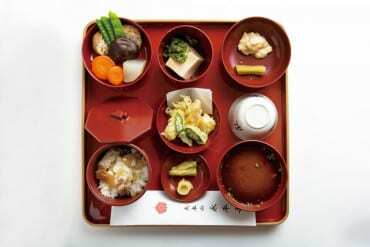 If you decide to stay a few days at the temple to meditate, this is an example of a meal you can expect to eat while you’re there. 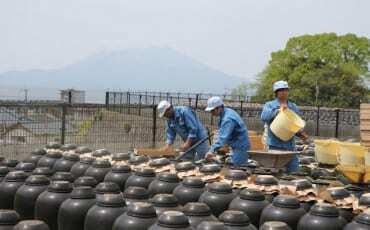 Apprentice monks prepare all meals using locally sourced ingredients, and they practise a strict “no wastage” policy. Visitors are required to follow a certain protocol during mealtime. There is chanting before and after the meal, and each bowl must be individually picked up to eat the food in it, and then set down in its original position. 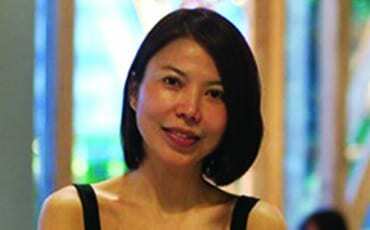 The monks believe that when proper order is followed during mealtime, this sense of purpose will translate into other aspects of the person’s life too. 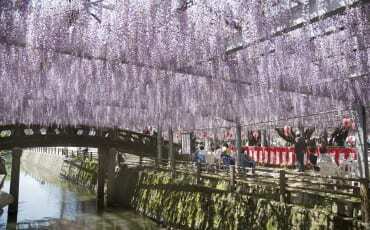 Dansuke supplies goma (sesame) tofu to several temples and shrines in the regio, and is an important source of protein for the vegetarian monks. Kuzu (arrowroot) and the roots of mountain plants are used as substitutes for gelatin, giving it that distinctive sticky texture. 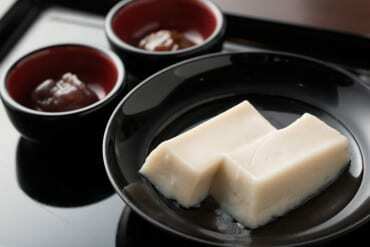 At Dansuke, you have the option of eating freshly prepared goma tofu with either miso or red bean. We found that saltiness of the miso paired especially well with the subtle fragrance of sesame — a healthy treat at any time of the day. You can also buy pre-packaged goma tofu to bring home as a souvenir. This sushi restaurant has been around for about fifty years now, and is now owned by second-generation chef, Hajime Matsutani. 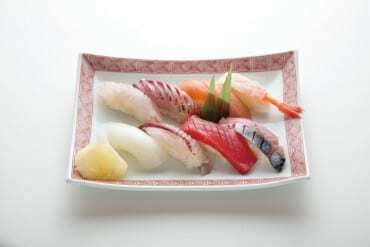 If it’s in season, be sure to try the sushi with red sweet snapper, as it is a type of fish only caught in Wakasa region. Besides sweet snapper, the chef also enjoys working with regular snapper, as it’s a versatile catch that can be enjoyed steamed, grilled, and deep-fried. All the fish sold at Hatsumitei are caught on the day itself. The first thing you’ll notice about the restaurant’s exterior is its unique lattice-design exterior, designed by famed architect Kengo Kuma. A modern take of a traditional Japanese pattern used in architecture, the design of the building is reflective of the food that’s served in the restaurant: A contemporary update of the Japanese kaiseki. 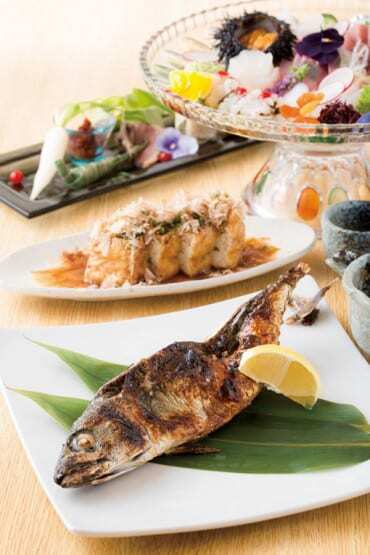 Helmed by Chef Hataji Hisamitsu with the intention of making kaiseiki more accessible to the younger crowd, the ingredients — handpicked by Chef Hisamitsu himself — are similar to those used in Japanese kaiseki, including the freshest catches are of the season. At this reservation-only restaurant, Chef Hisamitsu takes the effort to find out what occasion his customers are celebrating so he’s better able to customise the meal for them. 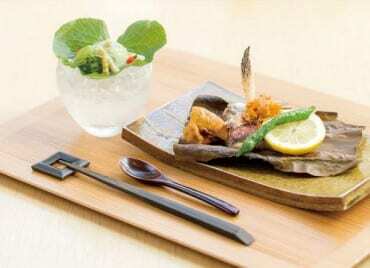 Pictured here is the fried wakasa gochi (also known as amadai), a type of fish caught in the Wakasa region of Fukui. Fresh produce and unfussy preparation methods are the cornerstones of g, Tsuruga-city, Fukui, 914-0072　Sogno-Poliood Italian cuisine. 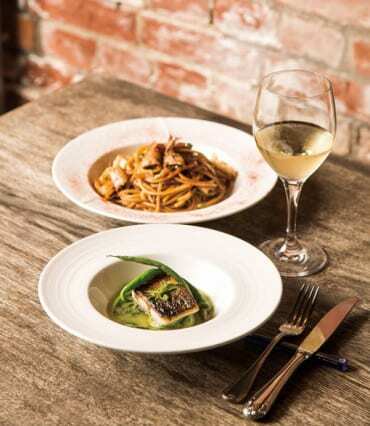 Clearly inspired by the time he spent in Italy honing his skills as a chef, Tsuyoshi Yamamoto opened Italian restaurant Sogno Poli in October 2015 as a way of showcasing some of the finest produce Tsuruga city has to offer. We tried a squid and cabbage pasta, which uses surumeika, a type of squid caught off the waters of Tsuruga Bay, and were won over by this simple dish’s fresh ingredients and robust flavours. 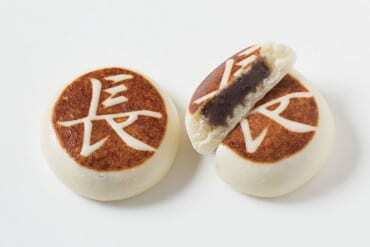 The city of Mikuni is famous for a sweet dumpling known as sake manju, which has a sake-flavoured skin and a filling of red bean paste. Made with leftover sake mash after fermentation, the dumpling doesn’t actually contain alcohol — only the delicate fragrance of sake. Sake manju was traditionally used in Japanese weddings, when these dumplings were tossed from the balcony of the house belonging to the groom after the bride has made her way there. This practice used to be more common a few decades ago, but has seen a revival in recent years. 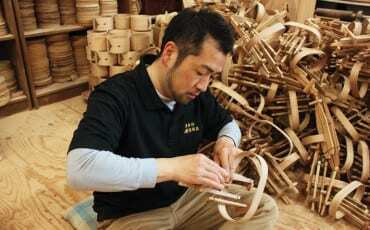 Nishisaka was established about a century ago, and is currently run by its third-generation owner. Sake manju can also be enjoyed deep-fried. Another restaurant that uses Fukui produce almost exclusively is Manmoto, which has been in same location for 71 years now. The fourth-generation owner and chef, Koichi Manmoto, often uses vegetables from his own farm. 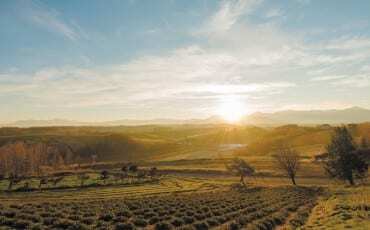 Clearly proud of Fukui produce, he wants visitors to enjoy the simple, home-style dishes at his restaurant, because he believes it’s not necessary to over-complicate matters when he’s already working with fresh ingredients. 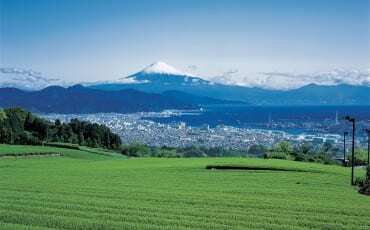 Manmoto is also unique in that it carries at least one sake label from every one of Fukui prefecture’s 36 breweries. Sake sampler sets are also available, because chef Manmoto wants visitors to Fukui to enjoy the wide range of sake the prefecture has to offer.